President-elect Donald Trump is greeted by the Azalea Trail Maids – goodwill ambassadors for Mobile, Ala. – after arriving at the local airport for a rally at Ladd-Peebles Stadium, Saturday, where he had the biggest rally of his campaign earlier this year. As Trump wraps up his victory tour in the South, he shows few signs of turning the page from his blustery campaign, gloatingly recappiong his Election Night triumph and doing little to quiet the chants of "Lock up up!" directed at Hillary Clinton. 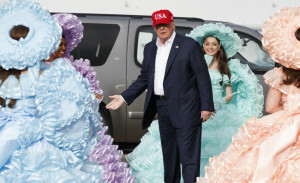 President-elect Donald Trump is greeted by the Azalea Trail Maids – goodwill ambassadors for Mobile, Ala. – after arriving at the local airport for a rally at Ladd-Peebles Stadium, Saturday, where he had the biggest rally of his campaign earlier this year. As Trump wraps up his victory tour in the South, he shows few signs of turning the page from his blustery campaign, gloatingly recappiong his Election Night triumph and doing little to quiet the chants of “Lock up up!” directed at Hillary Clinton.